Bangor University’s accommodation has made it to seventh’ place in a table of the top 20 Universities accommodation providers in the UK, based on 17,929 accommodation reviews on the site from students themselves. 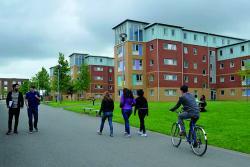 According to data from UCAS, the body which manages university applications, the quality of student accommodation is among the top ten factors which student consider when accepting a University place, and Bangor’s Halls of residence are among the ‘best in class’, providing the accommodation that students need. “We aims to provide our students a home from home experience while living in Halls of Residence with peer support by Mentors to help everyone settle in. From bills and gym membership, to the extensive “Campus Life” programme of free events and trips; every aspect of communal living is covered – and it’s all included! 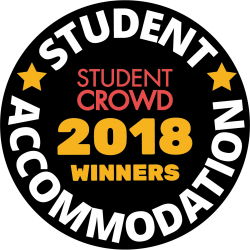 This latest placement follows a hat-trick of Awards for the University’s accommodation at the recent in National Student Housing Awards. The University was awarded Best Environmental Management and the Best Students Internet and also received an International Accommodation Quality Mark in the National Student Housing Survey Awards. This Quality Mark is awarded to accommodation providers achieving 90% satisfaction or above. These Awards are also solely based on student feedback from tens of thousands of UK students to the survey compiled by Red Brick Research.Bangor University was also recently ranked in the top 10 of the UK’s non-specialist Universities, according to the latest annual National Student Survey (NSS). The University was also awarded a Gold Standard in the first round of the UK Government’s Teaching Excellence Framework and consistently performs well, based on student responses in the WhatUni Student Choice Awards. Bangor is hosting a series of Open days for potential students, with the next being held on 28 October and 10 November this year. Potential students need to register to visit.